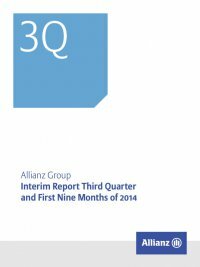 Interim Report Third Quarter and First Nine Months of 2014 Allianz Group22 Life/Health Insurance Operations Third quarter 2014 −− Statutory premiums grew strongly by 24.9 % to € 15.9 bn. −− Operating profit at a solid level of € 790 mn. Business segment overview ­­­Allianz offers a broad range of life, health, savings and invest- ment-oriented products, including individual­and group life insurance contracts. Via our distribution channels – mainly tied agents, brokers and bank partnerships – we offer life and health products to both private and corporate clients. As one of the worldwide market leaders in life business we serve customers in more than 45 countries. Key figures Key figures life/health € mn three months ended 30 September 2014 2013 Statutory premiums 15,853 12,698 Operating profit1 790 769 Net income1 530 562 Margin on reserves (bps)1,2 61 66 Statutory premiums3, 4 2014 to 2013 third quarter comparison On a nominal basis, statutory premiums amounted to € 15,853 mn, an increase of € 3,156 mn. Premiums increased by 25.0 %, or € 3,177 mn, on an internal basis. We recorded premium growth in most core markets – largely driven by our single premium business. These favorable develop­ ments were mainly due to the successful cooperation with our banc­ assurance channel in many European markets and our broker chan­ nel in the United States. Strong premium growth of unit-linked products in Italy and Taiwan and strong sales of fixed-indexed annu­ ity products in the United States were the main drivers of this devel­ opment. Premiums in Italy increased 76.7 %to € 2,789 mn. This growth was mainly due to the strong contribution of unit-linked and savings products distributed via our bancassurance channel. To further improve our product design and pricing, the sale of traditional guar­ antee savings products was largely replaced by savings products with 0 %-guarantees in the third quarter of 2014. Premiums in the United States increased to € 2,901 mn, repre­ senting growth of 73.7 %. This was driven by continued strong fixed- indexed annuity sales as a result of an innovative index strategy and higher penetration into the broker and dealer channel. However, as anticipated, it is below the level in the second quarter of 2014 due to the impact of the pricing changes in response to the decreasing inter­ est rate environment. This growth was partly offset by a decrease in the variable annuity business. In Asia-Pacific, premiums amounted to € 1,575 mn, growth of 34.5 %. This was largely driven by Taiwan – due to increased single premium unit-linked business – and by South Korea, where we recorded higher sales of single premium investment-oriented prod­ ucts via the bancassurance channel. 1 Effective 1 January 2014, the ­Allianz Group allocated certain entities from the reportable segment Asset Management to the reportable segments German Speaking Countries, Western & Southern Europe and Growth Markets within the business segment Life/Health and to the reportable segment Banking. 2 Represents annualized operating profit divided by the average of (a) the current quarter-end and previous quarter-end net reserves and (b) the current quarter-end and previous year-end net reserves, where net reserves equal reserves for loss and loss adjustment expenses, reserves for insurance and investment contracts and financial liabilities for unit-linked contracts less reinsurance assets. 3 Statutory premiums are gross premiums written from sales of life and health insurance policies as well as gross receipts from sales of unit-linked and other investment-oriented products, in accordance with the statutory accounting practices applicable in the insurer’s home jurisdiction. 4 In the following section, we comment on the development of our statutory gross premiums written on an internal basis, i.e. adjusted for foreign currency translation and (de-)consolidation effects in order to provide more comparable information.